The average size of this particular frog is nine centimetres, but some individuals may reach a maximum of eleven centimetres. 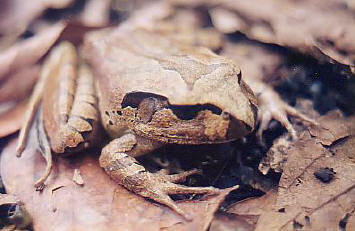 The northern barred frog can take from one to two years to fully develop. Their call note is a deep resonant "Wahk"
They are easily heard of a night time at Chambers Wildlife Rainforest Lodge. They can be seen along the creek walking path at Chambers Wildlife Rainforest Lodge. Is found throughout the wet tropics at both high and low altitudes. A large leaf brown frog with striking barring on the legs and large dark eyes. It has the habit of lowering its head and lying flat against the ground when disturbed, likely trying to blend in with the forest floor upon which it usually sits. And indeed, the beautifully subdued browns of it's skin enables the frog to blend in perfectly with its habitat of the leaf strewn rainforest floor. The call of this frog is a deep “waaarhhhhk”. It has the largest tadpole of any frog species in Australia. This species lives in the rainforests of North Queensland, and appears more common at higher altitudes.